This magazine ready Key West style Resort on Lake Osborne. This Property was rebuilt in 2008 and expanded into a luxurious tropical paradise like no other property. This 2 story home with oversized 3 car garage, 90 feet of waterfront offers 2 state of the art kitchens with Wolf and Sub Zero appliance's, an outdoor kitchen, commercial outdoor bar with pool access and submerged barstools ,white sandy beach with beach volleyball court, putting green, in ground trampoline and misting system throughout property and pool. 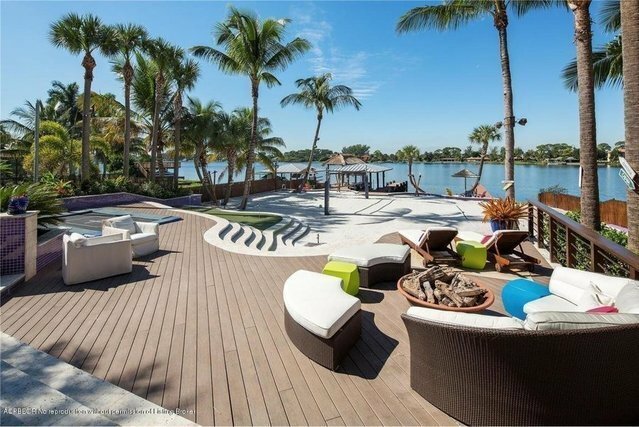 Boat ramp with multiple dock's & boat lifts for ski boat and jetski's, resort style pool with rock waterfall, fire features & hot tub, water features and fire pits throughout the property, round tile medallion with sprouting fountain and more.